Hey moonliner - thanks for stopping in! Your Starfire is a sight to behold - definitely part of the road that I am traveling now. Your Curtis Novak Bi-Sonic sounds very cool! 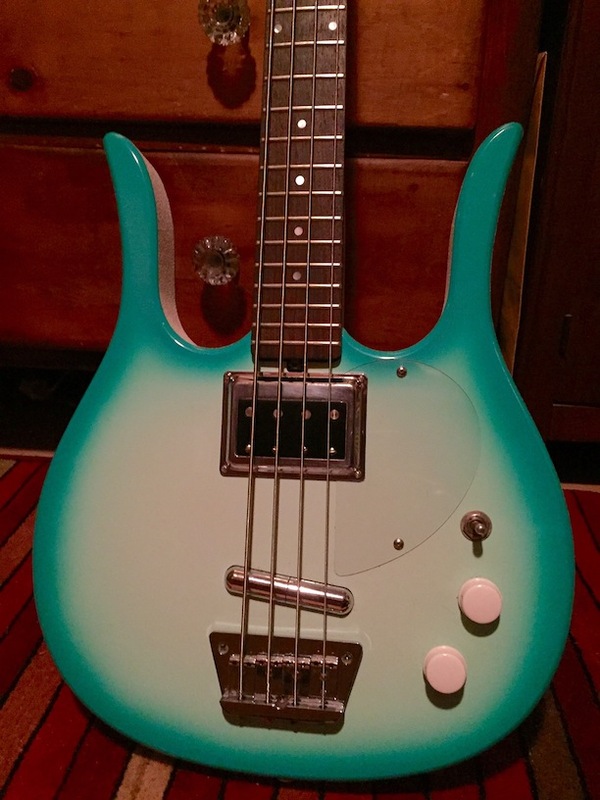 Would love to see a pic - I've never owned a Jerry Jones bass - is it the Danelectro kind of thing? Sounds like an interesting axe! Thanks! I'm really thrilled with how the Starfire turned out. Yes, the Jerry Jones basses I have are Danelectro longhorn remakes. Well built, lightweight, short scale? and weird looking! My main longhorn is cooper burst. I found this aqua burst on ebay a few months ago and thought I'd use it to test the Novak Bi-sonic. I seem to remember seeing a picture of Jimmie Vaughan playing a 6-string Longhorn, maybe on the inside of the SRV double live album - I always thought they were cool - that one is supercharged! 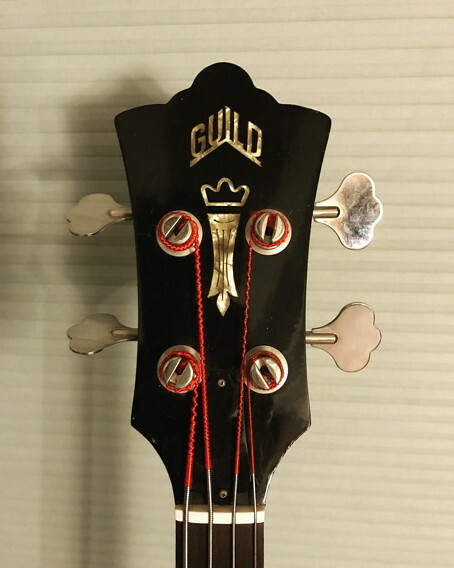 Re: Alembicize a Guild M-85 II solidbody? Made the trip up to Santa Rosa to A) try out Pliny the Younger at Russian River Brewing Company (waited in line for 3 1/2 hours!) and B) pick up a couple of instruments at the Mothership! Here's a preview - my early '70s solidbody fretless M-85 II has been Alembicized - more pics of the pickups when I get home tonight! Hey Harry, great to hear you were successful in your quest to taste PTY. Hope you found it worth the wait. Looking forward to seeing pics of the Guild. Did you pick up your double-neck, too? Yes, the doubleneck came home too! The 6-string neck is now tuned EADGBE like a Bass VI - feels so much better to me! The Guild sounds great, I played it a bit last night. The beer was good - glad I had the experience but I'll drink it locally in the future, or just stick with the Elder! 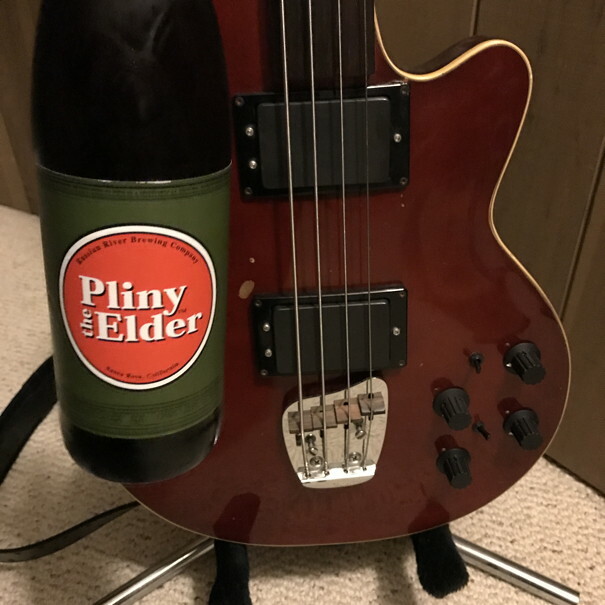 One beer from a 6-pack of Pliny the Elder, and a now-Alembicized factory-fretless Guild M-85 II - this is a new shell designed as a replacement for the Guild humbuckers - it's the original pickup rings - Anniversary electronics but mono - volume/filter/q-switch for each pickup - pickup selector (hidden behind the beer) is a normal one, not rotary, so no stand-by position but I don't really use that anyway. I'll start a new thread in the Showcase when I get some better pictures! Gonna wait for some new strings too before I record it. Thanks everyone! I'm really enjoying this bass, I love the way it feels and plays and now sounds! The earlier M-85 were usually semi-hollow, though apparently there are a few hollow-bodies out there. By 1971 or so they became thinner and solid like mine - I think mine might be one of the early solid-bodies - pretty soon after they added a master volume control. Nice Harry! Love the M-85. Still missing my '73 JS-II. Definitely a cool bass and the new electronics must help take the sound to a completely new place. Yay - finally started a thread in the "Instruments Customized by Alembic" section of the Showcase! I think a fretted short scale Guild with these pickups & electronics would be pretty cool - if not formidable!